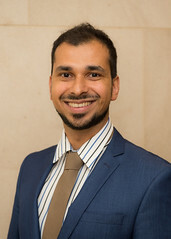 Post written by Farzan Bahin, MBBS (Hons), MPhil, FRACP, from the Department of Gastroenterology and Hepatology, Westmead Hospital, Sydney, Australia. This study evaluates the concept of reducing the rate of recurrence by extending the EMR to include a large normal mucosal margin beyond the visible extent of the lesion. Residual or recurrent adenoma (RRA) is a limitation of EMR of large sessile and flat laterally spreading colorectal lesions (LSLs), occurring at a frequency of 12% to 32%. Prevention of RRA has multiple theoretical benefits including extended surveillance intervals, cost savings, increased patient acceptance, and avoidance of surgery for refractory RRA or adverse events from additional endoscopic treatment sessions. We hypothesized that extending the resection margin to remove endoscopically inconspicuous adenomatous tissue could prevent RRA. We compared RRA among patients who underwent extended EMR (at least 5 mm margin) with historic control patients who underwent standard EMR (1-2 mm margin). The patients in both groups had similar characteristics, and the mean lesion size was 39 mm. EMR was attempted for 458 lesions in the standard EMR group and for 426 lesions in the extended EMR group, with visibly complete removal in 92% and 93% of patients, respectively. Extended EMR did not lower the rate of RRA at follow-up colonoscopy (10% vs 12% in the standard group, P = 0.15). RRA was located mostly at the edge of the EMR site in both groups (standard EMR 74%, extended EMR 68%; P = .58). In multiple logistic regression analysis, lesion size, the use of adjunctive thermal ablation, and intraprocedural bleeding were independently associated with residual or recurrent adenoma, whereas extended EMR was not. Extended EMR was independently associated with a higher risk of intraprocedural bleeding (odds ratio 3.1). Figure 1. A, A Paris IIa þ Is 70-mm granular laterally spreading lesion (LSL) occupying two thirds of the circumference of the descending colon. B, Extended margin of 10 mm taken during EMR. C, The resection defect extends to nearly the entire circumference. D, Resection defect demonstrating extended EMR occupying nearly the circumference of the descending colon. Small residual of adenoma in the superior margin yet to be excised. Extending the perimeter of the EMR had no beneficial impact on RRA. 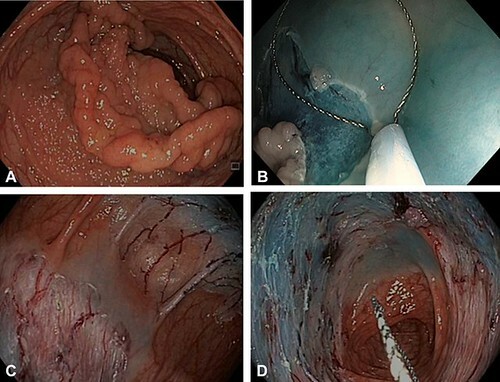 Microscopic adenoma in endoscopically imperceptible tissue bridges between piecemeal resections within or at the edge of the resection defect may be an explanation for recurrence. Alternative means of preventing RRA are required.